The UAC at 500 hpa in the South Arabian Sea has now tracked W/NW and is centred at 10.5N and 66.5E. The movement is because the 500 hpa ridge , till now over Central Arabain Sea, has shifted towards the North West. The UAC may move W/NW in the next 24 hrs. Another UAC has formed at 5N and 83E, South East of Sri Lanka. The UAC exists upto approximately 850 hpa level, and will posssibly descend in the same location as a Low (BB-1). As a Low, it will move in a Northerly track and deepen within next 2 days. BB-1 will strengthen to depression level, and could cross the coast on the A.P. coast. But, as we wait, we see a possibility due to certain resisting factors developing, of BB-1 just by passing the coast or even fizzling out in the waters off the South A.P. coast. South West Monsoon advancing in the South Andaman Sea around 15th May. MW -4 will be published on 15th May 2016. Movement has pushed the ridge or its pushed by ridge? is it steering with 700mb winds? does the strengthen of system can change the steering level? Andaman Sea Advancement on time or early? 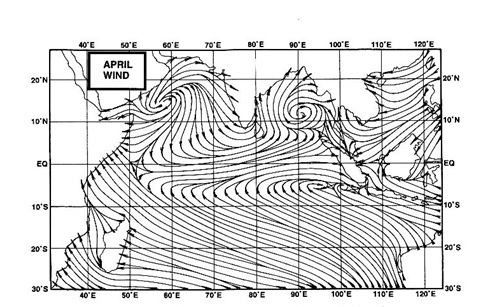 if the North Indian Ocean do not get engaged with cyclones in May then early onsets likely? Zohair: The words were used differently. Now re structred :-) As the Low strengthens, the steering levels do change most of the times. The arrival dates of Monsoon in Andaman Sea and the normal dates is mentioned in MW-3. Monsoon onset as per the dates mentioned in the MW-3. Rajesh sir,do you agree with my optimistic view that pre-monsoon rains are likely in mumbai and konkan from 20-22nd may or you disagree?Will arabian sea throw out a low? abizer: i know you have referred to the forecast which shows Mumbai getting some rains on 20th. But that is withdrawn and changed now. Anyway, if AS-1 forms, (read todays post), then what you say may happen.